A few weeks ago it was mine and the Hubby's anniversary. At the time we were unable to arrange babysitting so we didn't celebrate properly. We didn't really mind and it ended up being pretty much like any other day. Not long after that we arranged babysitting and had a weekend child-free, I was a little excited to be honest. 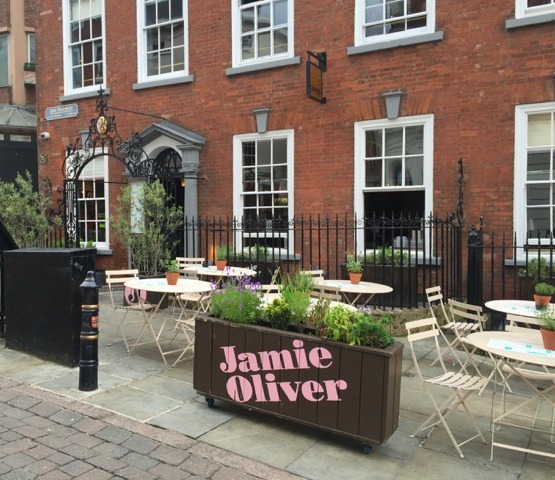 As luck would have it I was then invited along to Jamie's Italian Nottingham for a review. Given that we had babysitting arranged already I figured it would be the perfect opportunity for the Hubby and I to have a belated celebratory meal out. As we drove towards Nottingham for our night out we chatted in a quiet car, it was lovely to not have to shout over arguing children. We arrived at Jamie's Italian a little early and decided to have a drink in the bar before going to our table. As it was an Italian restaurant we both decided to stick with the theme and have drinks to match. 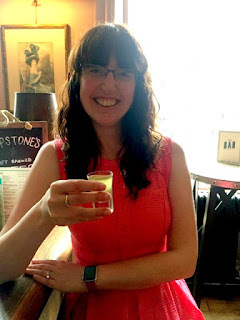 The Hubby had an amaretto and I had limoncello, the sweet, citrusy liqueur was just what I needed to start a great night. I loved the bar, although it was small the decor made it feel homey and the barman was courteous and polite. We weren't in there long though, as soon as we'd finished our drinks we went to our table. We followed the host upstairs to our table which was located in the central dining room. I could see another dining room next to ours. As I walked into the dining room I felt like I was walking into someone's home to have dinner. Small candles sat on top of all the tables and I could see an old fireplace in another dining room. When the waitress brought us the menus we were spoilt for choice and it took a while to decide what we wanted to eat. We decided to order drinks before we chose our food. After perusing the cocktail menu the Hubby decided to try Jamie's Mojito and I chose a Stiletto Manhattan. If you've ever had a mojito you'll know that it's a fresh, minty drink made with white rum and sparkling water. 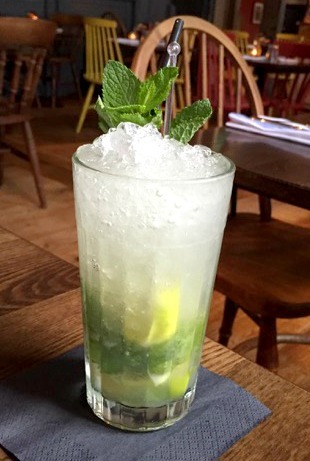 Jamie's Mojito is made using Bacardi Superior Rum and topped with Jamie's Prosecco. The Hubby enjoyed it. 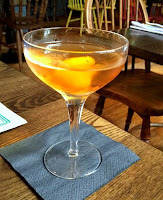 The Stiletto Manhattan is made using Jack Daniels, amaretto and Martini Dry, and I thought it would be quite strong and therefore last a while. I also loved the name! The sweet taste of amaretto disguised the other alcohol enough to make the cocktail very drinkable, it didn't last as long as I'd hoped. Once our drinks had been ordered we looked at the food menu. There were so many tasty sounding options it was a difficult choice to make. In the end I chose Italian Nachos for starter and Fresh Crab Spaghetti for main and the Hubby chose Fresh Crab Bruschetta for starter and Tagliatelle Bolognese for main. 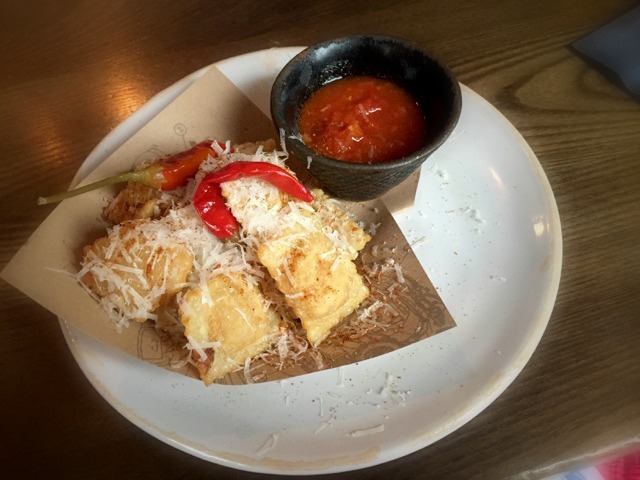 "Crispy fried ravioli stuffed with three cheeses, served with arrabbiata and Parmesan"
I'm not a big fan of cheese, apart from when it's on pizza, so this isn't something I would usually choose. However, I love Nachos and that's what tempted me. When the waitress brought this to the table my mouth watered, it looked so yummy. The Nachos stayed crisp as I bit into them, even with it soaked in arrabbiata which had a kick to it. I'm not sure which three cheeses they use but it doesn't matter, the whole thing was delicious. If the Hubby hadn't pinched a couple of these nachos before I started he wouldn't have been able to try them. I would definitely have these again. "Dressed with finely sliced fennel, lemon and chilli"
When this arrived at the table I was almost disappointed that it wasn't my starter (I hadn't tried my nachos yet). 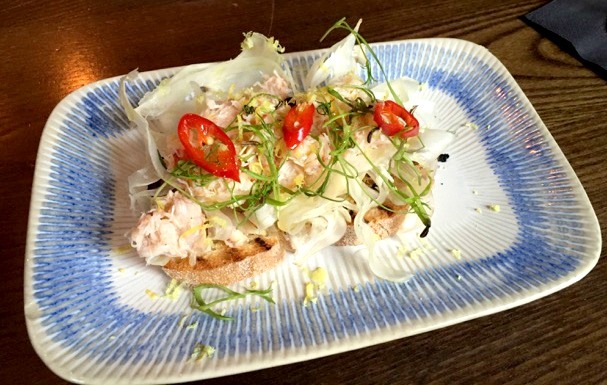 I love bruschetta and crab is one of my favourites too. Within minutes the Hubby had finished it off, luckily I'd pinched a piece before it all disappeared. The crab was succulent and the fennel, lemon and chilli complimented it. The bruschetta was crispy and crumbled in my mouth. Another great choice that I would recommend. Once the starters were finished with I looked around the dining area again. I loved the homey feel of the area. The tables aren't too closely packed and even though there were 5 other groups in the dining room it wasn't too loud. 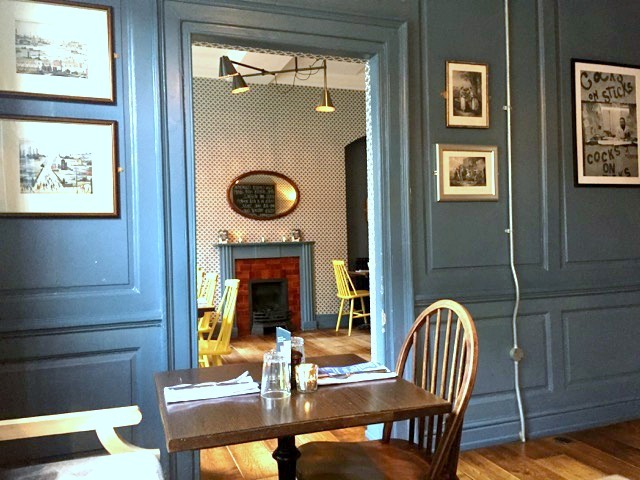 As I was sitting waiting for the main course to be served I enjoyed the homey ambience. In the past, at other restaurants, we've been served our mains almost as soon as we've finished our starters. In Jamie's Italian we waited a while, which I liked, it gave me a chance to enjoy my starter and not feel stuffed too soon. Not to mention the fact that I got to enjoy sipping my Stiletto Manhattan while I waited! "With capers, chilli, fennel, parsley, anchovies and lemon." The Fresh Crab Spaghettini comes in two sizes, I chose the larger one. As I said earlier I love crab and this main course did not let me down. I wouldn't hesitate to order it again. 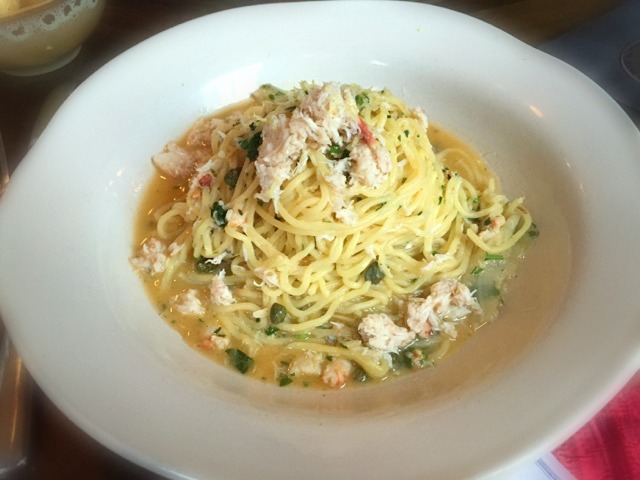 The spaghetti was soft and tasty, the crab was moist and a refreshing change. Selecting the larger option may have been a mistake because I couldn't finish the whole thing. I was stuffed but still wanted to eat because it was so nice. I would have the Fresh Crab Spaghettini again in a heartbeat, it was heavenly. 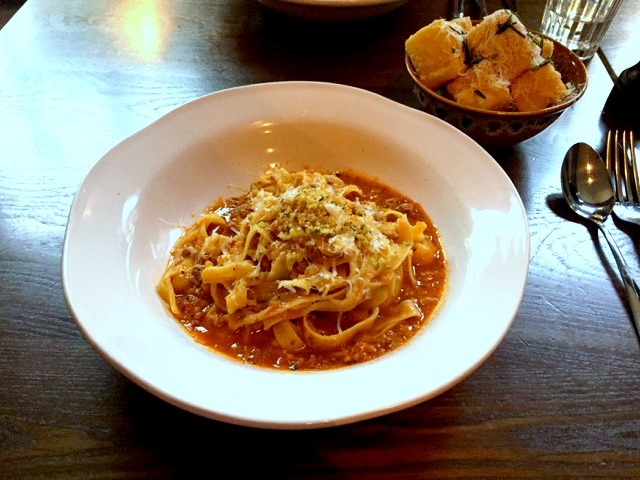 "Ragù of beef shin and pork shoulder with herbs, Chianti & Parmigiano Reggiano and crunchy, herby breadcrumbs." When it comes to Bolognese you pretty much know what you're getting. There are only so many bolognese you can have before you're bored of it right? This is one of the best Bolognese I've tried (yes, I pinched some of the Hubby's food) and the Tagliatelle somehow seemed better than spaghetti because it was soaked in the bolognese. The Hubby finished it off in record time (ok, that's just my opinion) and said it was really good. He'd have it again if given a chance. 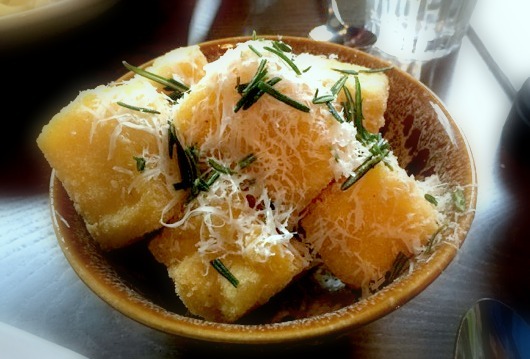 After a recommendation from +Dadyougeek we tried the Polenta chips. To be honest I was so engrossed in enjoying my Fresh Crab Spaghettini that I only had one of these. The Hubby had more and enjoyed them. The dessert menu had four things that we wanted to try, it was really hard to choose and the Hubby even tried to convince me to have four desserts! "Velvety mascarpone and lemon cheesecake topped with Italian meringue, served with lemon curd and blackcurrants." In the past I've found that cheesecake can be a very heavy dessert and I often avoid it but the lemon convinced me to try it. I am so glad I chose to have this dessert. The mouth-watering, lemony scent filled my nose as I ate my first bite. 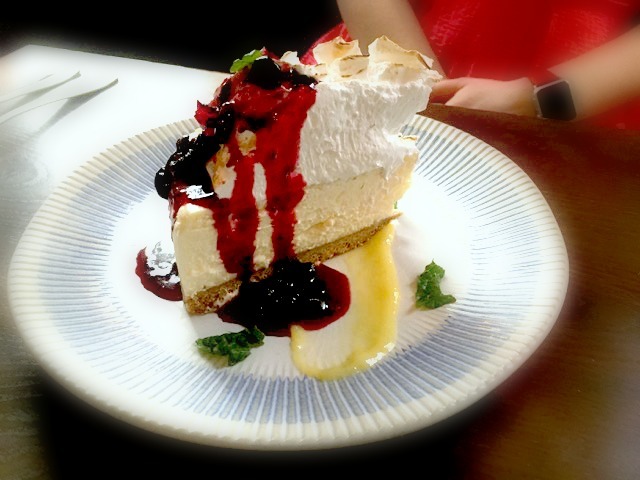 The cheesecake was rich and creamy, the meringue sweet and airy, and the base was crumbly. The lemon curd and drizzled blackcurrants added an extra fruity taste to the whole thing. It was the best cheesecake I have had in a long time. 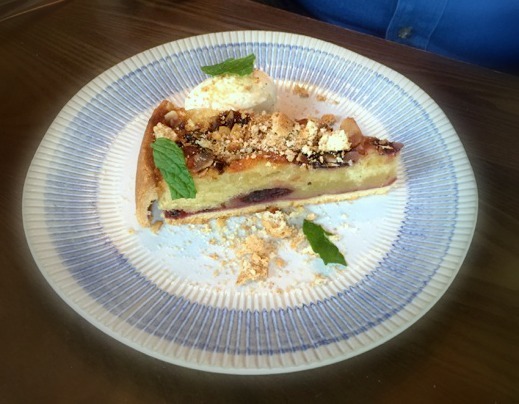 "Almond sponge and buttery pastry studded with sour cherries, served with whipped honey cream and smashed amaretti." I was lucky to even get to try this dessert because the Hubby liked it so much. Again, sponges can be on the heavy side but this wasn't. The sponge was moist and the sour cherries were delicious. 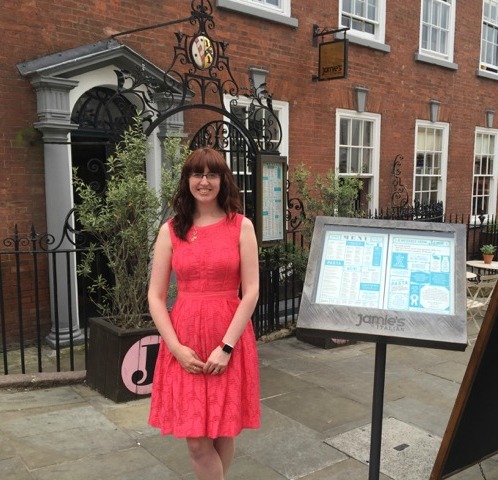 The Hubby enjoyed it so much that on Saturday, as we were walking past Jaime's Italian, he wanted to go in, just for the Sour Cherry and Almond Tart! As a family we look forward to going to restaurants but sometimes put it off because of cost. 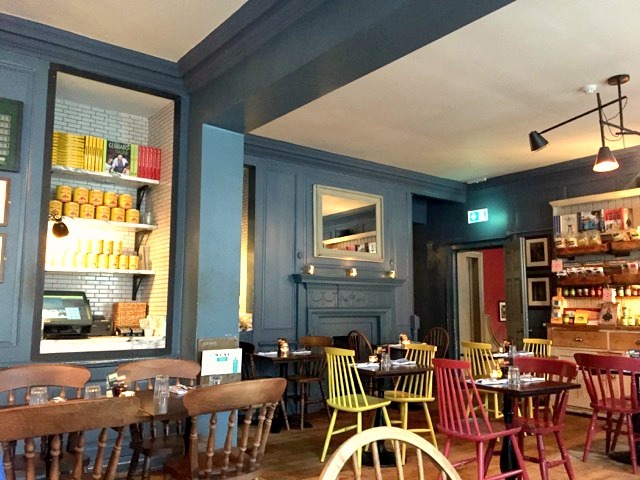 Jamie's Italian is not the cheapest restaurant, nor is it the most expensive, and given the quality of the food it is one of the best options. 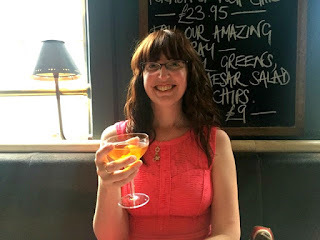 Both the Hubby and I loved our meal at Jamie's Italian Nottingham and will definitely be returning (with our boys in tow) in future. It really was, they have lots of options and I noticed that they cater for coeliacs too!